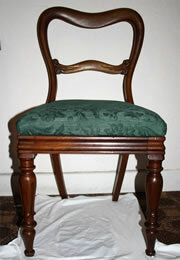 Wanted - 4 mahogany dining chairs to match, with stuff over backs and seats. Please note the detail on lower back rail and legs. 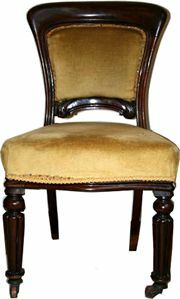 Wanted - Early Victorian mahogany dining chairs with turned front legs and stuff over seat to be an exact or very close match to the one in the photos. 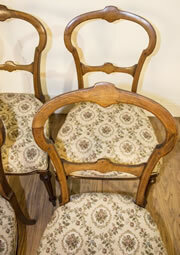 Condition of upholstery and webbing not important as long as frame is sound and secure.